"Wilberforce, Ontario" redirects here. For the Black Canadian settlement of Ontario, see Wilberforce Colony. Highlands East is a township located in Haliburton County, Ontario, Canada. The township was incorporated in 2001, through the amalgamation of the former townships of Bicroft, Cardiff, Glamorgan and Monmouth. Cardiff is a former mining community; the mines opened in 1956 and closed several years later. The chief mineral being mined in Cardiff was uranium. Cardiff is located on Highway 118 between the towns of Bancroft and Haliburton. The Cardiff Elementary School is a small school. The community also has a Royal Canadian Legion hall, a Catholic and United Church, as well as an outdoor pool which is popular during the summer, Post Office, Municipal Office, Library, and a Skating Rink that doubles as an outdoor Basketball/Floor hockey court. The entrance to the townsite, off of Highway 118, is marked by a large metal sculpture of a dragonfly. Gooderham is bordered on the south by the Irondale River and Pine Lake to the north. It is located on a now defunct railway line, the IB&O Railway, part of which has been since converted into a trail network. The village of Gooderham is at the intersection of the Monk Road from the east and the Buckhorn Road from the south. The origin of the name Gooderham is not known for sure although it is likely that it was named after a member of the distillery-owning Gooderham family donated money for a local church. In any case, it was called Gooderham by the time the first post office was established in 1873. The first mills were built by 1875 using the waterfall between Gooderham Lake and the Irondale River. Logging and farming were the original attractions of the Gooderham area and Gooderham still has an active lumber mill. Wilberforce was established as "Pusey," a station on the Irondale, Bancroft and Ottawa (IB&O) Railway, and named for railway president Charles J. Pusey. This little railway had initially been built to carry iron ore from open pit mines at Irondale. Although the mines had closed, the railway had high hopes of extending to Bancroft and even higher hopes of reaching Ottawa. At Wilberforce where the railway skirted the southern shore of Pusey Lake (now Dark Lake), the Wilberforce Lumber Company put up a sawmill. In 1909 the Wilberforce mill was leased to James Lauder and Joseph Spears, of Toronto. The IB&O Railway was taken over by the Canadian Northern Railway in 1912. Messrs. Lauder and Spears along with Lucien B. Howland, (the former General Manager of the IB&O), looking for new business opportunities, acquired a sawmill on the new CNR line north of Parry Sound, Ontario. The three men eventually established the community of Lost Channel in the Parry Sound District, and went bankrupt in the process. Wilberforce is known among geocachers as the "Geocaching Capital of Canada." The first cache in the Town was "Wilberforce be With You" placed by Geofellas. 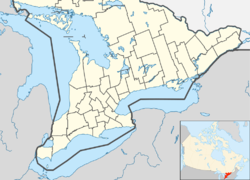 The township also contains the smaller communities of Cheddar (ghost town), Cope Falls, Deer Lake, Dyno Estates, Essonville, Harcourt, Highland Grove, Hotspur, Ironsides, Maxwells, Pusey, South Wilberforce, Tory Hill, Upper Paudash, Ursa and Ward. Highland Grove was home to "Camp Diamond" the site of a fabled but unfounded diamond mine. The site was used as a hockey camp for a short period of time and later became an all girls summer recreational camp. Highlands East has 5 fire halls located throughout the municipality, with stations located in Cardiff, Highland Grove, Gooderham, Wilberforce and Paudash. The Highlands East Fire Department only has one full-time employee, its Fire Chief, with all of the firefighters being volunteers. ^ "Highlands East census profile". 2011 Census of Population. Statistics Canada. Retrieved 2012-02-21. ^ "2011 Community Profiles". 2011 Canadian Census. Statistics Canada. July 5, 2013. Retrieved 2012-02-21. ^ "2006 Community Profiles". 2006 Canadian Census. Statistics Canada. March 30, 2011. Retrieved 2012-02-21. This page was last edited on 18 April 2019, at 00:37 (UTC).